Astronomers have combined radio telescopes from five continents to prove the existence of a narrow stream of material (jet) emerging from the only gravitational wave event involving two neutron stars observed so far. These findings have now been published in the Science magazine by an international team of scientists, led by Giancarlo Ghirlanda from the National Institute for Astrophysics (INAF, Italy). Professor Leonid Gurvits (JIVE and TU Delft) is co-author of the Science paper. In August 2017, two neutron stars were observed colliding, producing gravitational waves that were detected by the American LIGO and European Virgo detectors. Neutron stars are ultra-dense stars, roughly the same mass as the Sun, but similar in size to a city like Amsterdam. This event is the first and only one of this type that has been observed so far, and it happened in a galaxy 130 million light years away from Earth. Astronomers observed the event and the subsequent evolution across the entire electromagnetic spectrum, from gamma-rays, X-rays to visible light and radio waves. Two hundred days after the merger, observations combining radio telescopes in Europe, Africa, Asia, Oceania, and North America proved the existence of a jet emerging from this violent collision. These findings have been published in the Science magazine by an international team of scientists, led by Giancarlo Ghirlanda from the National Institute for Astrophysics (INAF, Italy). 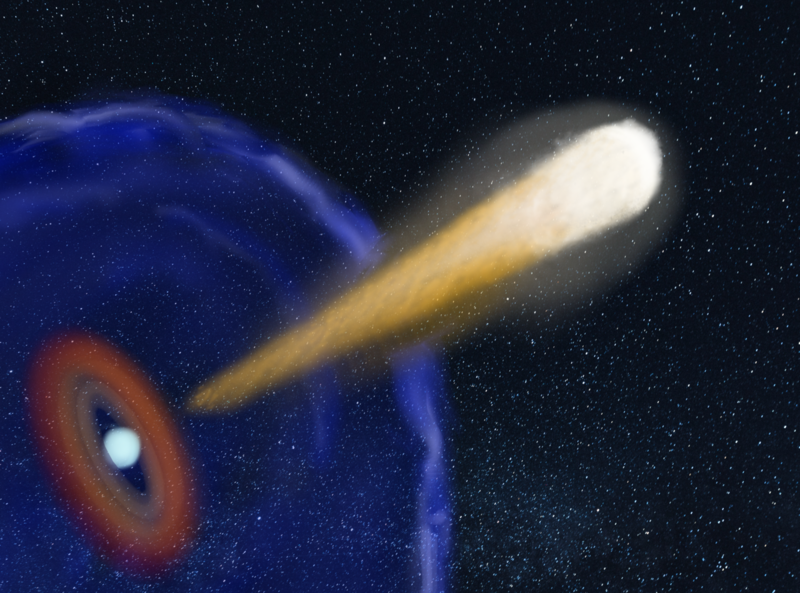 This neutron star merger represented the first case where it was possible to associate a detection of gravitational waves to an object emitting light. 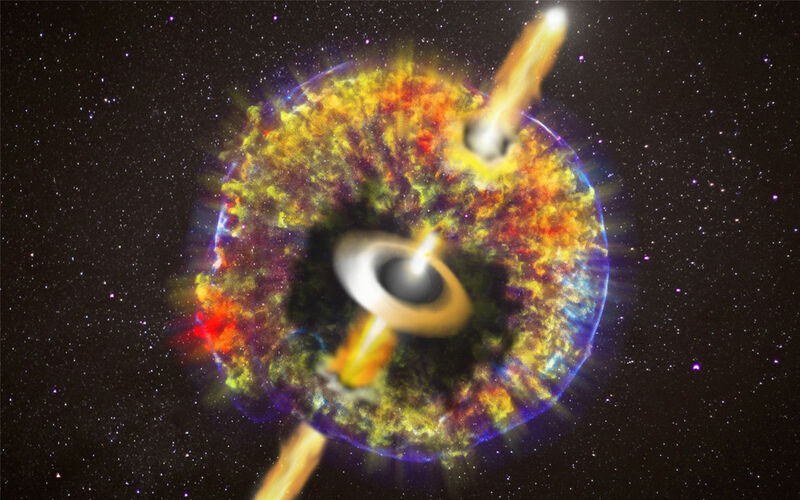 The event has confirmed scientific theories that have been under discussion for tens of years, and the association of neutron star mergers with one of the most powerful explosions in the Universe: gamma-ray bursts. After the merger, a huge amount of material was expelled into space, forming a shell around the object. Astronomers have been tracing its evolution at different wavelengths. However, there were still some remaining questions concerning this event that could not be clarified by any previous observations. "We expected part of the material to be ejected through a collimated jet, but it was unclear whether this material could successfully pierce through the surrounding shell." explains Ghirlanda. “There were two competing scenarios: In one case, the jet cannot break through the shell, instead generating an expanding bubble around the object. In the other, the jet is successful in penetrating the shell and then propagates further into space”, expands Tiziana Venturi (INAF). Only the acquisition of very sensitive radio images with very high resolution would discard one scenario or the other. This required the use of a technique known as Very Long Baseline Interferometry (VLBI) that allows astronomers to combine radio telescopes all around the Earth. 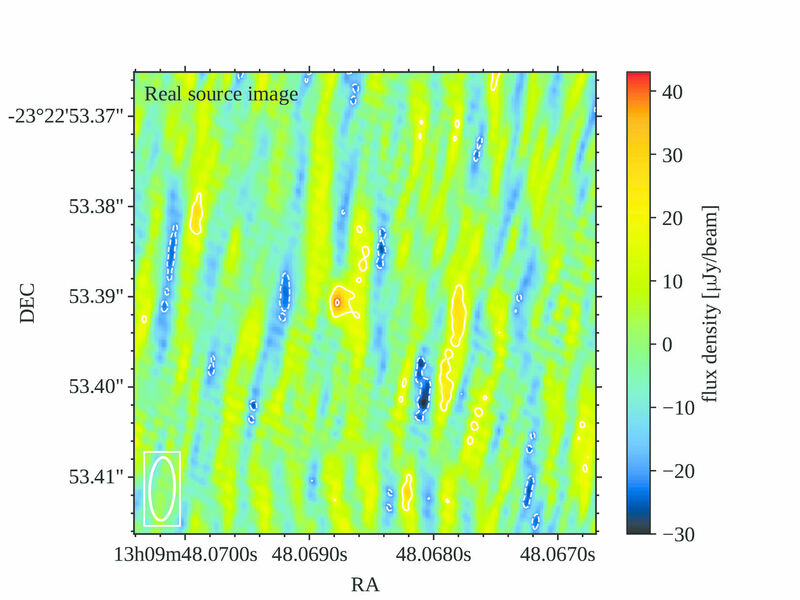 The authors of this publication conducted global observations in the direction of the merger on 12 March 2018 using 33 radio telescopes from the European VLBI Network (that connects telescopes from Spain, the United Kingdom, The Netherlands, Germany, Italy, Sweden, Poland, Latvia, South Africa, Russia, and China), e-MERLIN in the UK, the Australian Long Baseline Array in Australia and New Zealand, and the Very Long Baseline Array in the USA. The data from all telescopes were sent to JIVE (The Netherlands), where the most advanced processing techniques were used to produce an image with a resolution comparable to resolving a person on the surface of the Moon. In the same analogy, the expanding bubble would appear with an apparent size equivalent to a truck on the Moon, whereas a successful jet would be detected as a much more compact object. "Comparing the theoretical images with the real ones, we find that only a jet could appear sufficiently compact to be compatible with the observed size", explains Om Sharan Salafia (INAF). The team determined that this jet contained as much energy as produced by all the stars in our Galaxy during one year. “And all that energy was contained in a size smaller than one light year”, says Zsolt Paragi (JIVE). In the coming years, many more of these neutron star binary mergers will be discovered. “The obtained results also suggest that more than 10% of all these mergers should exhibit a successful jet”, explains Benito Marcote (JIVE). "These types of observations will allow us to unveil the processes that take place during and after some of the most powerful events in the Universe", concludes Sándor Frey (Konkoly Observatory, Hungary). Professor Leonid Gurvits (JIVE and TU Delft) is co-author of the Science paper. “In 2015, distortions in space-time known as gravitational waves were first detected when two supermassive black holes collided. However, only the collision of relatively small objects like neutron stars that produces gravitational waves too, leaves behind a firework of electromagnetic radiation. This is what has been detected for the first time in relation to the gravitational wave event of August 2017”, he explains. “Electromagnetic emissions can give you information about the colliding objects themselves, the physics of such a collision and its product as well as many other things. With the help of VLBI we could observe the aftermath of the collision with extremely high resolution. Thus, we were able detect the source of the electromagnetic radiation and its parameters. That is a unique achievement, because we are talking about miniscule quantities of emitted energy”, he says. 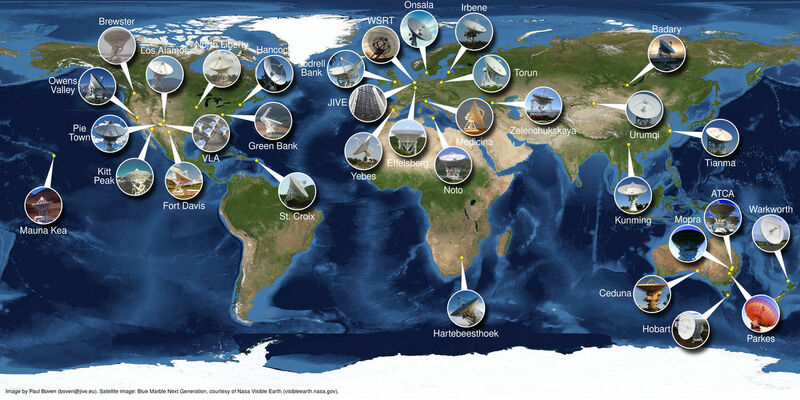 VLBI is a powerful technique to study the natural objects in the Universe, but JIVE and TU Delft are currently also working on a related technique for planetary missions. This is PRIDE, short for Planetary Radio Interferometry and Doppler Experiment. “We can use the same VLBI methodology and telescopes to observe artificial radio sources like spacecraft, and this can be of great benefit to planetary missions”, Gurvits, Principle Investigator of PRIDE says. “With PRIDE, we can determine the position and velocity of spacecraft that are flying anywhere in Solar System with great accuracy, down to tens of meters. That in turn can provide us with information about the gravitational field of the planetary body, its atmosphere, morphology of its surface and so on”. PRIDE is selected as one of the eleven experiments on board the ESA’s JUpiter ICy moons Explorer mission (JUICE) that is set to launch in 2022, and the only experiment of this mission that will be led from The Netherlands.